It’s infectious, it’s about my favorite fast food joint, and it’s… Christmas-y? BONUS VIDEO: A recut of the preview as if it was 70’s Grindhouse film. Enjoy. 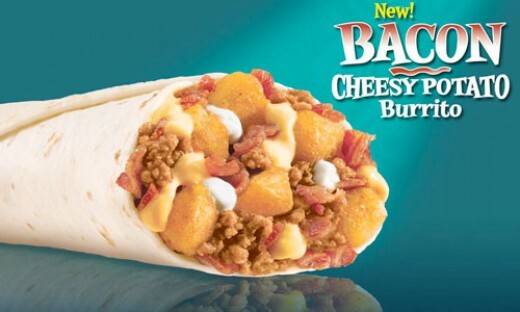 BONUS PLEA: If anyone out there has any pull at Taco Bell, it would give me new hope to know that they might bring chili cheese burritos back. I mean, seriously, what did chili ever do to you, Taco Bell? You can have potatoes and bacon, and not chili? You can even have BellHedz and not chili?! JusWondering… Can You Get Drunk Off Milk? So far, four days in, I’ve managed to keep up with the plan and maintain the social habits in which my usuals are consumed. Yet alas, here I am, prodding through with my plan, having nightmares about caving in and drinking Mt. Dew (seriously), getting tempted like crazy. But something strange has been occurring the last few nights. As I sit down on my couch to prepare for a late night, pre-bedtime viewing of TV shows on DVD (just finished the hilarious It’s Always Sunny in Philadelphia… Burn Notice is next), I’ve been partaking of a glass or two of low fat organic milk. And after drinking that second glass, I’ve been feeling a wee bit tipsy. So I decided to investigate if this was a phenomenon, or merely something in my head. I remember in the short-lived comic book, X-Nation 2099, the mutants would get drunk off of milk. So why can’t I? Apparently babies can get drunk off of breast milk. In Japan. Of course. There are many cases of infantile beriberi (kakke) in Japan. In most instances the mother of the afflicted infant has beriberi. However, sometimes the mother is healthy (concealed beriberi). Ito observed such a case in which the mother did not have beriberi and called the condition “mother’s milk intoxication.” But he afterward changed this name to “breast milk intoxication” because he saw cases in babies who were nourished with the milk of wet-nurses. PETA wants us to drink beer and wine, and not milk. Of course. PETA (People for the Ethical Treatment of Animals) is very provocative in its media campaign about milk, but it is correct in its message. Beer is indeed better than milk for health, as are both wine and distilled spirits. Bill Murray drinks a glass of warm milk before he goes to bed. The next morning, after awakening in our dirty Snuggies, we tried recalling the run for the border. We remembered that it was more like a regular deli that had a Taco Bell in the back. The Taco Bell was closed, yet the front remained in business. Weird. Steve didn’t think he purchased any food, and I cannot confirm or deny that fact, but I do know he inquired about it. The rest is fuzzy, and so was Steve. He wasn’t feeling too hot on the morning of our ride home, whereas this time, I felt fine. Upon learning of my faux pas regarding the hot dog joint/secret bar, we made the decision to seek it out properly before leaving. We had to know if it truly did exist. While outside enjoying “da bomb frostins,” we bore witness to a scene straight out of Police Academy. A short cop was surrounded by tall European women, in their late teens to mid-twenties (with an elder or two over-seeing them), and he was posing for pictures with them. There were well over a dozen of them (a baker’s dozen? ), and he had to make sure there was variety in his stylings. When Steve and I walked into Magnolia, he was letting them put on his hat and hold his night stick. When we were eating, he was fastening handcuffs on one of the girls. I just imagined that if he was called for an emergency, he’d leave her behind locked up. I’ve finally made a union with someone at Union Square. Not too be confused with Mark's Place. I pushed open the door, and the guy behind the counter told me it didn’t open until six. Bummer city. Lift the receiver and wait for approval to enter the secret bar. In one of my dreams last night, I watched/participated in the new G.I. Joe: The Rise of Cobra movie. It began rather inoccuously, meaning it didn’t seem at all like G.I. Joe. There was a compound and the team was being built. It was comprised of a bunch of your movie stereotypes (which I won’t go into because it doesn’t bode well for my subconscious). I remember a moment where a group of us were in a steel-decor room and cardboard boxes full of ammo rested on the center table. The captain or general or secretary (I don’t recall) said “Go!” and everyone lunged for the weapons like they were candy, stuffing grenades, guns, and dynamite in their pockets. I also think that the compound was somehow connected to a resort, like in the old episodes of Get Smart. The reason I bring this up is because at one point, after a member of my team falls through a concealed trap door, in searching for him, we fall through a similar hinged entrance. We end up trapped with our fallen friend in a room on the resort side. The windows are shatter-proof and there are no doors. We can’t escape. Then through the windows, we see a couple that I apparently met earlier. They open the window from a latch outside, but they won’t let us out unless we can name who’s singing the song coming from their bedroom TV next door. Right away, I know who it is: Shania Twain, and she’s doing a duet with Eurotrash superstar (?) Juraveggio Mugaiojdvkiaw… (I don’t know exactly – it was some weird dream name). I just don't have enough dreams about her. Anyyojoe… my team ends up getting shipped out to do battle with Cobra, and it’s at this point that I realize I watching/participating in the G.I. Joe: The Rise of Cobra movie and I’m pissed! It took this long to get to any battles?! There was a car chase that lead to a field with way too many chain link fences. Bullets! Bombs! Explosions! Like the costume on the left, but more in the direction of the one on the right... also, is she smiling at her own reflection? As I struggle to get to my feet, he removes his mask, and lo! Who is it? I walked out of the movie/woke up because I thought it was stupid. Math is fun (yeah, right). And as I’ve mentioned before, drinking math is not. So today, I’m just going to lay out some basic numbers when it comes to me and my imbibing. Demetri Martin eat your Cheesy Double Beef Burrito out! JusWondering… What Will Tomorrow/Today Bring? I am going to guess the events of my tomorrow tonight. 6 am – My alarm will start going off. It’s actually 5:42 am because I set my alarm ahead 18 minutes to get me two extra nine minute snoozes (I’m a snooze addict). 7:12 am – I will consider starting to get moving, but I’ll remember the clock is fast and I know I can get another two snoozes in. 7:30 am – I will kick on the radio, grab a Pop Tart (I’ll consider the Hot Fudge Sundae, but will go with the Chocolate Fudge considering it’s not as messy), and pore some organic milk (see Theory Sheet up above for reason why). 8:15 am– A shower, a toothbrushing, a drying, and a dressing later, I will be hitting the road, and moving off alarm clock time. early 9 o’clock hour – I will see a Denny’s restaurant and evaluate my hunger and time frame levels. Denny’s is supposed to be giving out free Grand Slams from 6am to 2pm. I will suspect that I am not hungry due to the Pop Tart and will keep on trucking. around 10 am – I’ll be arriving at the client, ready to perform the job at hand. I’m slated for six hours of setting up equipment and running wires. around 10:15 am – I will find out there is some catch to the wiring job, i.e. there is no ladder, no drop ceiling… something that will put a snag in the time frame. around 10:20 am – I will come up with some workaround. around noon – I’ll realize I haven’t eaten since 7:30 am (7:12 am real time). I’ll consider leaving to grab a bite, but I’ll be in the middle of something and decide to work through it. around 1 pm – I’ll call the Detroit office because the planned connection between locations will have some type of issue. around 2 pm– Another surprise – spyware is on a pc! around 3 pm – I’m really starving, but the end is in sight! around 4 pm – I’ll be packing up equipment for the ride home. I’ll be wishing I stopped at Denny’s. around 5:30 pm – After making it through a slight traffic jam in near Bowling Green (and stopping at the Meijer store located there for no reason), I’ll see the Denny’s I should have stopped at, and stop at a Taco Bell instead. around 7 pm– I’ll finally arrive home, and realize I didn’t get a chance to write an entry for my other blog, Old Men at the Bar, because I was too tired for it last night/right now (how meta). around 8 pm – I’ll realize there’s nothing on TV I want to watch, and I’ll be glad that I saved the last DVD from the 3rd Season of Weeds for tonight. I’ll hope there’s more than two episodes left, because I’m hoping that right now. A few minutes into the show, I’ll pause it and grab my laptop and write a post to see how the day compared to my expectations.